How do you begin to tell the story of a single street? Do you start at its geographic origin or terminus? Describe its length, breadth and width? Provide a summary of the buildings that line it? Or, do you attempt to narrate the lives of the many individuals who occupy it? While there is obviously no single right way (and each of the options above equally valid), I have chosen to begin with a plan and with the idea of a street. On this first map of Los Angeles, which extended the boundaries of the original Spanish pueblo according to the “compass of private property”, the street currently known as Figueroa was referred to as Calle de las Chapules or Grasshopper Street. 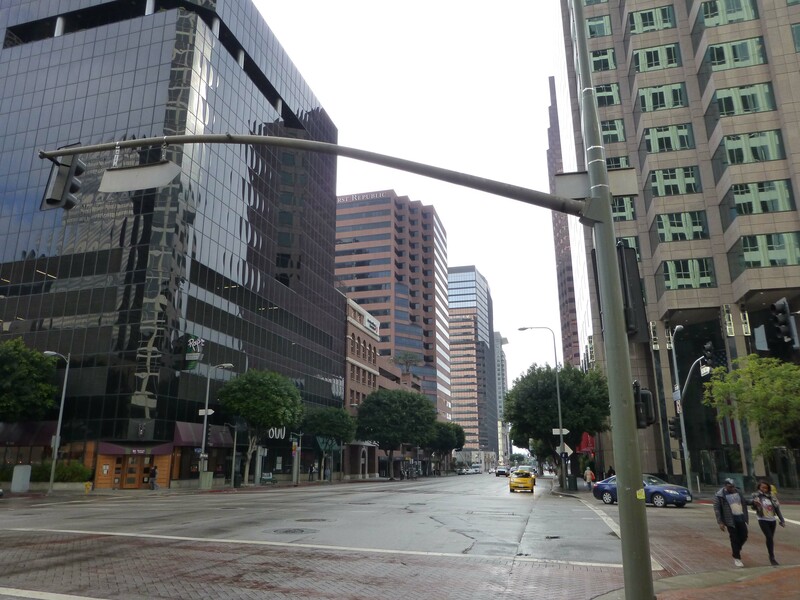 Figueroa began at the base of a series of hills at 8th Street and marked “the extreme western street of the city” (figure 1 and 2). According to James Guinn, the name came from the “myriads of grasshoppers hatched on the low grassy plans of the Ballona and Cienegas. When they had devoured all vegetation where they originated, they took flight, and, flying with the wind, moved in great clouds towards the east – like the locusts of Egypt, devouring everything in their course.”  Another story gives specific credit to the wife of O.W. Childs who owned most of the land in the area for naming the street. A third more poetic story suggests that the name came about because pedestrians on the corner of Eighth and Grasshopper “used to leap about while sour-faced policemen whistled and chased the crowds from one corner to the other”. On Ord’s map, Calle de las Chapules travelled south from the hills in a direct line. 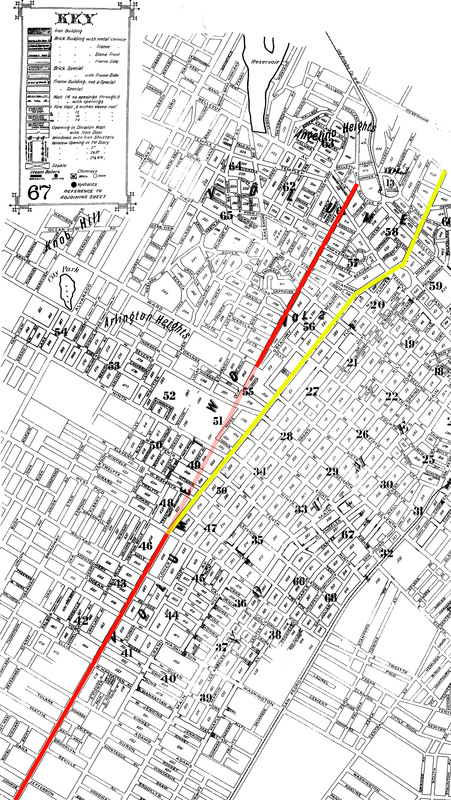 By 1857 when Henry Hansen confirmed and expanded the original diagram, the street had been extended on the north to Sixth and to Twelfth Street on the south where it intersected a new street at a diagonal angle. For reasons I have yet to uncover, Calle de las Chapules was renamed Pearl Street sometime in the 1860s or early 1870s. 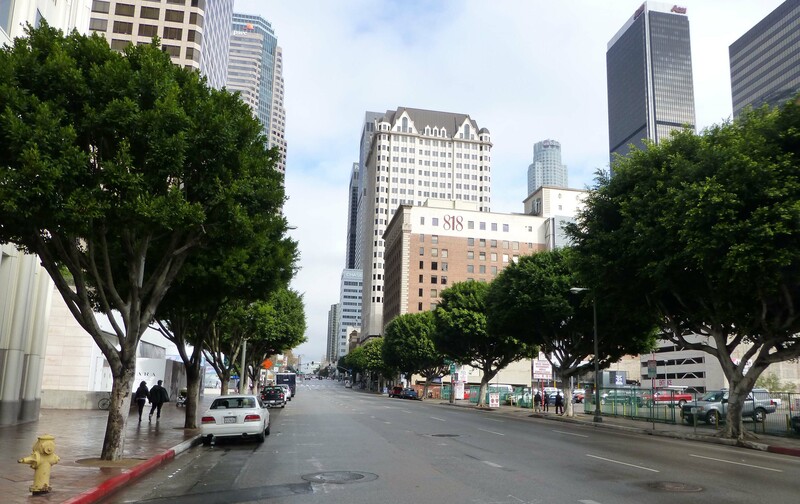 An article in the LA Times describes the intersection of Pearl and Figueroa: “Pearl Street comes into Figueroa at a very slight angle, which is hardly noticed in this city of crooked streets, and the latter street has been taken possession of by residents, fenced in, built on and planted in orchards, though the city officials state that the street has never been abandoned.” The existence of these orchards and buildings may explain why on the first Sanborn Map of Los Angeles from 1888, Figueroa is divided in two (figure 3). The southern section extends from Pearl, while the northern portion is located between Ward and Bellevue.